VideoPad is free video editing and movie making software for Windows. This video editing application can use various file formats including .avi, .wmv, .3gp, .wmv, .divx and many more. Create great looking videos with the intuitive user interface. Batch HTM TO MHT Converter is HTM to MHT, HTML to MHTML/MIME-HTML Batch Converter for MIME HTML Web archiver. It can convert HTM to MHT, HTML to MHTML/MIME-HTML automatically. Batch HTM TO MHT Converter supports powerful search for a lot of files. Batch Access Database Compactor is an Access DB Compact, Access Database Compactor that compact and repair access database easily. Batch Access Database Compactor can compact and repair Access Database without Office installed. Batch Word Shrink Compactor is a Word Doc Compact, Word Doc Compress Shrinker that can shrink/reduce Word document size easily. Batch Word Shrink Compactor supports powerful search for a lot of files. It's a user friendly Word Packer and Shrinker. Batch CHM TO DOC Converter is a CHM to Word Doocument Batch Converter that can convert HTML Help to Word DOC and DOCX easily. Batch CHM TO DOC Converter supports powerful search for a lot of files. A Compressed HTML Help converter for Windows. Batch PPT AND PPTX Converter is a PowerPoint PPT to PPTX, PPTX to PPT Batch Converter that can convert PPT to PPTX and PPTX to PPT easily. Batch PPT TO PPTX Converter supports powerful search for batch files. A PPT and PPTX converter for PowerPoint. Batch PPT TO PDF Converter is a PowerPoint PPT/PPTX to PDF Batch Converter can convert PowerPoint PPT(X) to PDF (Portable Document Format) easily. Batch PPT TO PDF Converter supports powerful search for lots of files. A PDF publisher for PowerPoint. Batch XLS AND XLSX Converter is a Excel XLS to XLSX, XLSX to XLS Batch Converter that can convert Excel XLS to XLSX and XLSX to XLS easily. Batch XLS TO XLSX Converter supports powerful search for a lot of files. A XLS and XLSX converter for Excel. Batch XLS TO PDF Converter is a Excel to PDF, XLS/XLSX to PDF Batch Converter that can convert Excel XLS/XLSX to PDF (Portable Document Format) easily. Batch XLS TO PDF Converter supports powerful search for a lot of files. A PDF publisher for Excel. 00 Clips can copy and store up to 25 different clips, text or graphic and you can synchronize your clips between PCs using Onedrive. You can allocate hot keys or macros to clips and paste them directly from your keyboard. It also has a superb encryption system which allows you to sign in to all your web sites safely while only having to remember one master password. The variety of options includes, auto-minimize after pasting, clearing the Windows clipboard, editing clips, reducing graphic clips, pasting your digital photos and editing and pasting screen shots. 500 Clips is also an excellent screen capture program. To capture the entire screen, type Prt Scr. To capture just the active window, type Alt + Prt Scr. To capture graphics from Word or Internet Explorer, right click on the graphic and click copy. The graphics editor allows you to add text, and clip art as well as crop, re-size and rotate your screen shots. 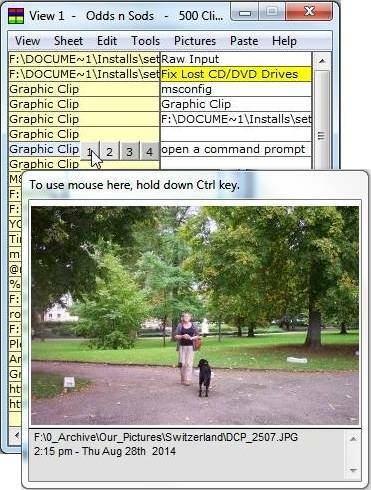 Unlike the standard Windows Clipboard, 500 Clips allows you to paste graphic clips directly into Outlook and Windows Mail emails. You can even have it automatically reduce the size of photo clips as it pastes. 500 Clips Clipboard manager is free and runs in all versions of Windows from XP to 10.